A former Jewish carpenter spoke Monday morning at Liberty University. No, not that one! It was Sen. Bernie Sanders (I-Vt.), whose liberal, secular worldview surely isn't shared by many students at the Lynchburg, Va., school founded by the late reverend Jerry Falwell Sr. 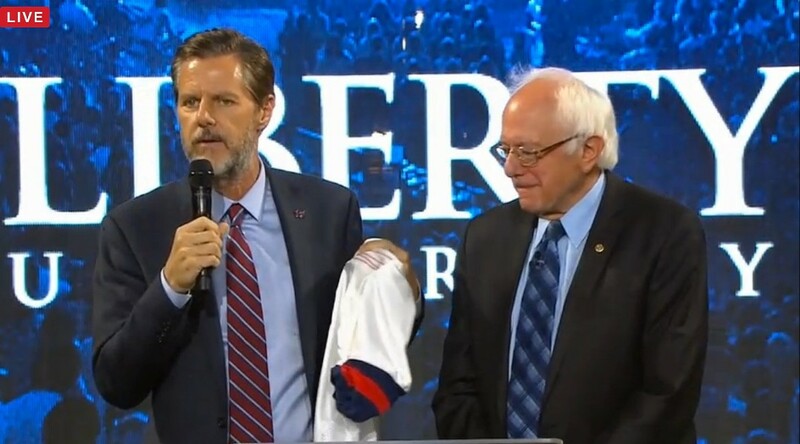 The founder's son and successor, Jerry Falwell Jr., acknowledged as much when he introduced Sanders onstage at the school's weekly mandatory convocation. "People have been asking, 'Well, are you going to be able to find any common ground with the senator?' And I think I did," Falwell said as he handed Sanders a Liberty soccer jersey. "I think, in the future, he's going to be a fan of the Liberty Flames. So we've already found some common ground, I hope." Some, but not much. No sooner had Sanders thanked the chancellor for inviting him to Lynchburg than he articulated his differences with the school's conservative credo. "Let me start off by acknowledging what I think all of you already know, and that is the views that many here at Liberty University have and [mine], on a number of important issues, are very, very different," Sanders said. "I believe in women's rights and the right of a woman to control her own body. I believe in gay rights and gay marriage. Those are my views and it is no secret." A small group of Sanders' supporters, who had been invited to attend the event, cheered loudly, while many students remained quiet. "But I came here today because I believe, from the bottom of my heart, that it is vitally important for those of us who hold different views to be able to engage in a civil discourse," the senator continued, drawing applause from many more in the audience. "I do believe it's possible we can find common ground." Sanders praised Liberty for its work "to understand the meaning of morality" and its quest "to teach its students how to behave with decency and with honesty" and to "best relate to your fellow human beings." Then he outlined familiar campaign themes in less familiar language — framing his platform as both moral and just. "When we talk about morality and when we talk about justice, we have to, in my view, understand that there is no justice when so few have so much and so many have so little," he said. Sanders also borrowed from the words of Pope Francis, an avowed economic liberal, and quoted from the bible — twice. "Let me tell you that it goes without saying, I am far, far from being a perfect human being, but I am motivated by a vision which exists in all of the great religions — in Christianity, in Judaism, in Islam, in Buddhism and other religions," Sanders said. "And that vision is so beautifully and clearly stated in Matthew 7:12, and it states, 'So in everything, do to others what you would have them do to you, for this sums up the law and the prophets.'" 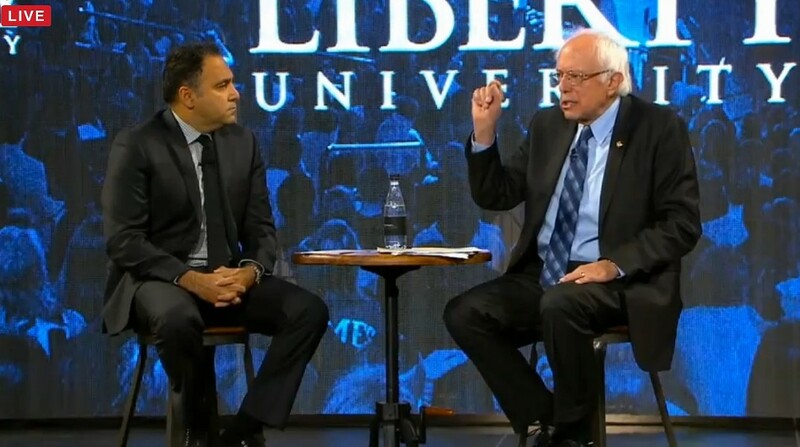 Liberty University vice president David Nasser quizzes Sen. Bernie Sanders. During a brief question-and-answer period following Sanders' remarks, Liberty's senior vice president for spiritual development, David Nasser, said the senator would "find a lot of commonality" with students over such issues as low wages, hunger, racism and higher education — if not others. And, indeed, Sanders drew loud applause with an answer about how he would work to eradicate racism — an answer he ended with a dig at Republican presidential candidate Donald Trump. "When we hear political leaders appealing to the worst elements of us by making racist attacks against people from another country or people whose color may be different from most of us, we have got to stand up and say, 'In America, we're not going to do that. Racism is not acceptable.'" "We couldn't agree with you more on that thought," Nasser responded. Drawing the loudest and most sustained applause of the morning was not Sanders, but Nasser. "Sen. Sanders, you've talked in your campaign about how it is immoral to protect the billionaire class at the expense of our most vulnerable in our society — obviously children," Nasser said. "A majority of Christians would agree with you ... but would also go further and say that children in the womb need our protection even more." Before he could go on, Nasser was interrupted for 25 seconds by cheering and clapping students. Sanders sat still with a tight smile on his face. "Obviously, you can see this is what they want to ask," Nasser continued. "How do you reconcile the two? Again, I know that you have a different view. I know that you, sir, and I don't have to be eye-to-eye on it. But I sense a real sincerity in you in wanting to see our children protected. Can you see, sir, how we see the child in the womb as the most vulnerable that needs protection?" "I do understand that," Sanders replied. "This is an area where we disagree. I do understand and I do believe that it is improper for the United States government or state government to tell every woman in this country the very painful and difficult choice that she has to make on that issue." Saying he didn't want to be "too provocative," Sanders nevertheless pointed out that conservatives often say, "Get the government out of my life. I don't want the government telling me what to do." But when it comes to abortion, he intimated, they feel differently. "I respect absolutely a family that says, 'No, we're not going to have an abortion.' I understand that. I respect that," he said. "But I would hope that other people respect the very painful and difficult choice that many women feel they have to make and don't want the government telling them what they have to do."